Being a full time parish priest with a family, a variety of hobbies, and three dogs means that I will not always be able to respond quickly to communications through this website, but I will do my best! 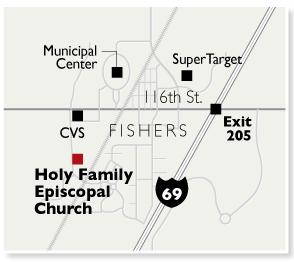 If you are in the Indianapolis area, you are very welcome to try out Holy Family, whether you are looking for a church home, a one time sabbath, or are just curious about the results when a congregation tries out some of the concepts and approaches on this website. Please click over to the parish website for the latest information on worship times and other activities.